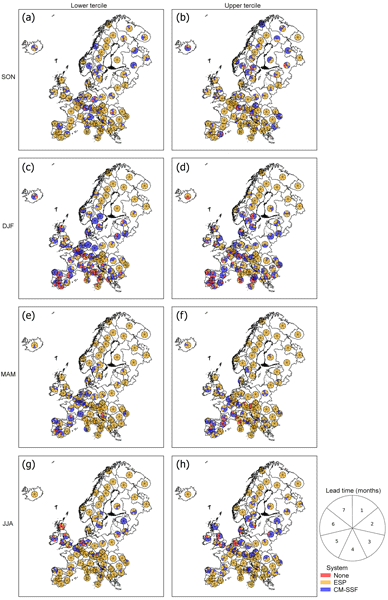 Skilful seasonal forecasts of streamflow over Europe? 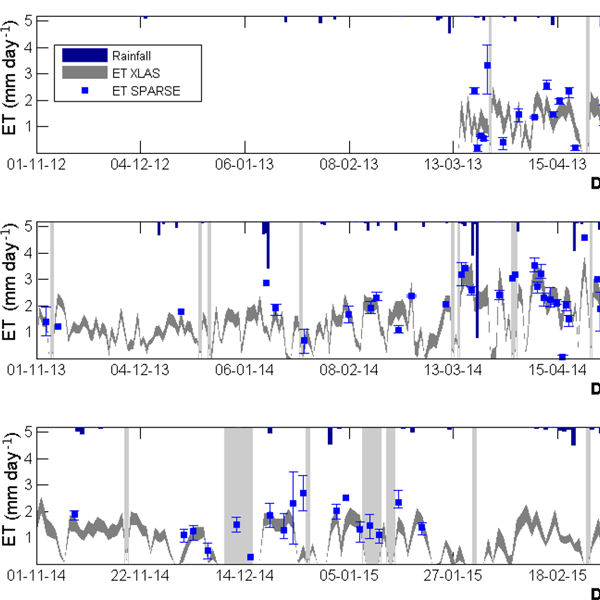 This paper presents a new operational forecasting system (driven by atmospheric forecasts), predicting river flow in European rivers for the next 7 months. For the first month only, these river flow forecasts are, on average, better than predictions that do not make use of atmospheric forecasts. Overall, this forecasting system can predict whether abnormally high or low river flows will occur in the next 7 months in many parts of Europe, and could be valuable for various applications. We describe a forecasting procedure that is based on a semi-distributed hydrological model using two types of weather ensembles for the lead time period: observed weather data, constructed on the basis of the ESP methodology, and synthetic weather data, simulated by a weather generator. We compare the described methodology with the regression-based operational forecasts that are currently in practice and show the increased informational content of the ensemble-based forecasts. This study generate a historical global monthly gridded water withdrawal data (0.5 × 0.5 degrees) for the period 1971–2010, distinguishing six water use sectors (irrigation, domestic, electricity generation, livestock, mining, and manufacturing). This dataset is the first reconstructed global water withdrawal data product at sub-annual and gridded resolution that is derived from different models and data sources, and was generated by spatially and temporally downscaling country-scale estimates. This study uses remotely sensed river discharge data to correct river storage and discharge in a large-scale hydrological model. The method is based on an ensemble Kalman filter and also introduces an additional technique that allows for better constraint of the correction (called localization). The approach is applied over the entire Amazon basin. Results show that the method is able to improve river discharge and localization to produce better results along main tributaries. Application-oriented regional impact studies require accurate simulations of future climate variables and water availability. We analyse the quality of global and regional climate projections and discuss potentials of correction methods that partly overcome this quality issue. The model ensemble used in this study projects increasing average annual discharges and a shift in seasonal patterns, with decreasing discharges in June and July and increasing discharges from August to November. 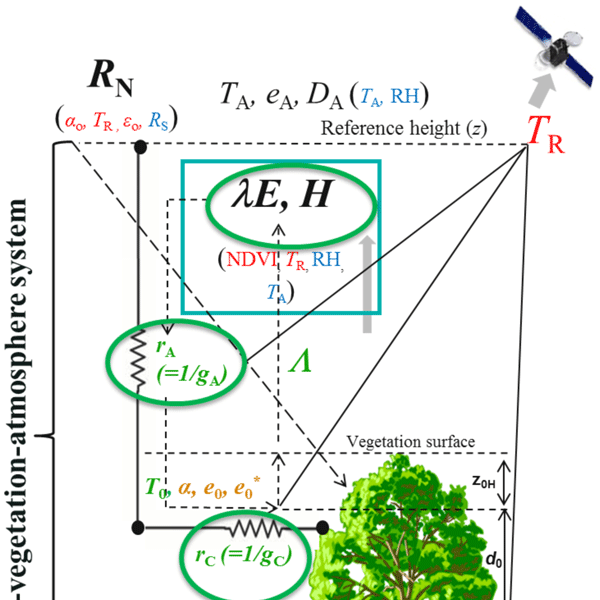 This study evaluated the performances of an energy balance model (SPARSE model) forced by MODIS remote sensing products in an operational context to estimate instantaneous and daily evapotranspiration. The validation protocol was based on an unprecedented dataset with an extra-large aperture scintillometer. Indeed, to our knowledge, this is the ﬁrst work based on XLAS measurements acquired over the course of more than 2 years. 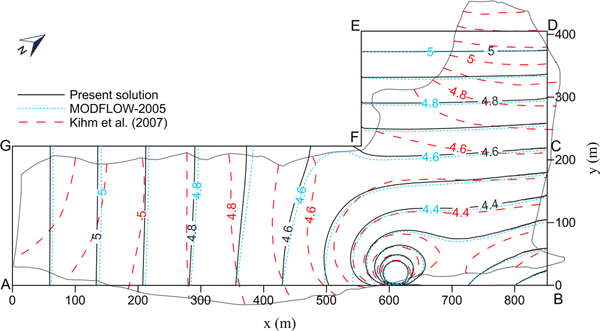 In many glacio-hydrological models glacier areas are assumed to be constant over time, which is a crucial limitation. Here we describe a novel approach to translate mass balances as simulated by the (glacio)hydrological model into glacier area changes. We combined the Δh approach of Huss et al. (2010) with the bucket-type model HBV and introduced a lookup table approach, which also allows periods with advancing glaciers to be represented, which is not possible with the original Huss method. Central Asia crucially depends on water resources supplied by snow melt in the mountains during summer. 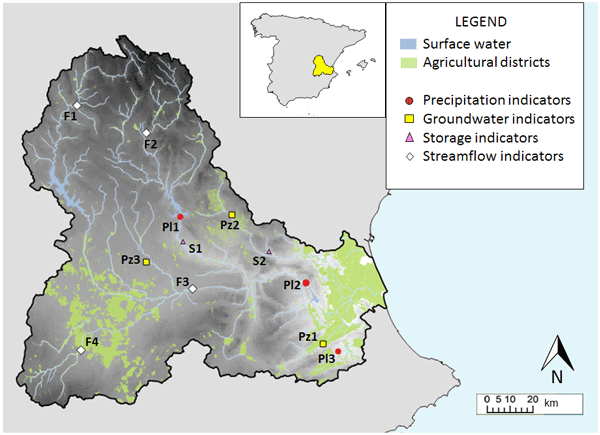 To support water resources management we propose a generic tool for statistical forecasts of seasonal discharge based on multiple linear regressions. The predictors are observed precipitation and temperature, snow coverage, and discharge. The automatically derived models for 13 different catchments provided very skilful forecasts in April, and acceptable forecasts in January. Remote sensing has been popular for mapping surface soil moisture. However, estimating subsurface values using surface soil moisture remains a challenge, as decoupling can occur. 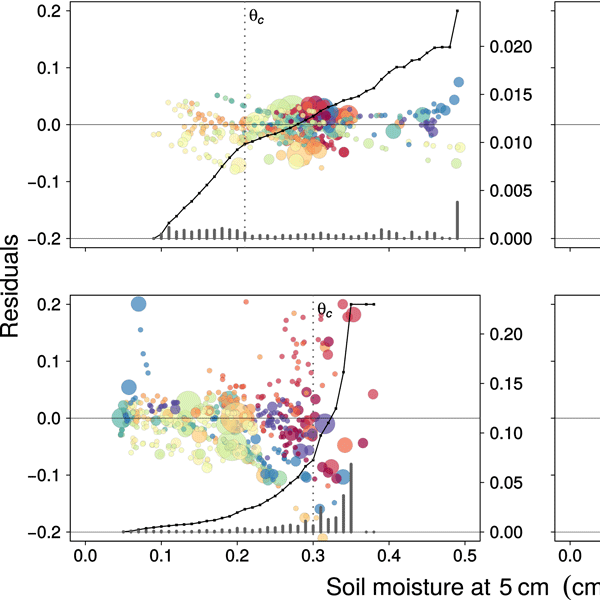 Depth-integrated soil moisture values used in hydrological models are affected by vertical variability. Using statistical methods, we investigate vertical variability between the surface (5 cm) and subsurface (40 cm) to quantify decoupling. We also discuss potential controls for decoupling during wet and dry conditions. Key predictors of annual peak daily streamflow (APF) in the Fraser River Basin are investigated. 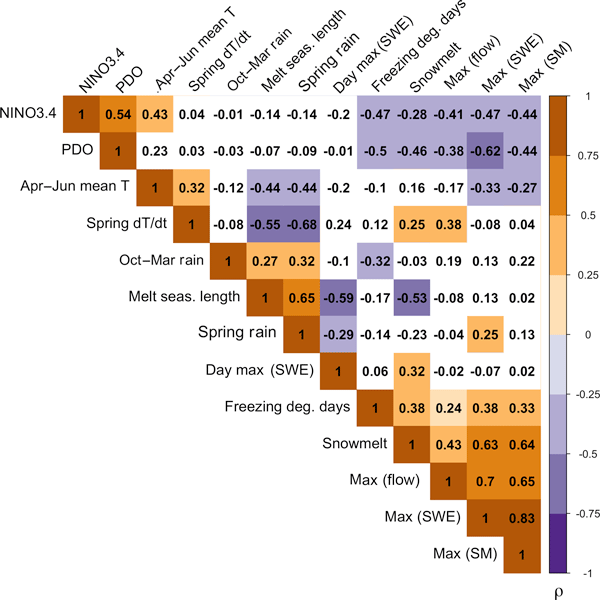 While annual maximum snow amount is a robust predictor of APF, the role of other climatic factors in the largest historical floods is less well understood. Using observations and a process-based hydrological model as input to a multivariate regression approach, we show that the snowmelt rate, indices of large-scale climate variability, and spring warming rate also influence APF in the Fraser Basin. In this study we propose using the equilibrium temperature approach to model complex heat transfer processes at the water–air interface in the SWAT model, which reflects the influences of air temperature, solar radiation, wind speed and streamflow conditions on the heat transfer process. 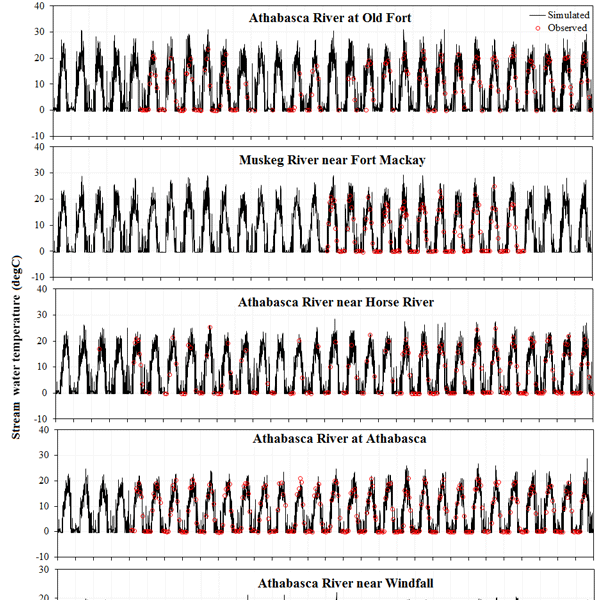 The results indicate that the equilibrium temperature model provided a better and more consistent performance in simulating stream temperatures in the different regions of the Athabasca River basin. An semanalytical model is developed for estimating the groundwater flow and stream depletion rates (SDR) from two streams in an L-shaped fluvial aquifer located at Gyeonggi-do, Korea. The predicted spatial and temporal hydraulic heads agree well with those of simulations and measurements. The model can be applied to evaluate the contribution of extracted water from storage and nearby streams. This paper assesses the performance of an analytical modeling framework for probability distributions for summer streamflow of 25 Swiss catchments that present a wide range of hydroclimatic regimes, including snow- and icemelt-influenced streamflows. Two versions of the model were tested: linear and nonlinear. 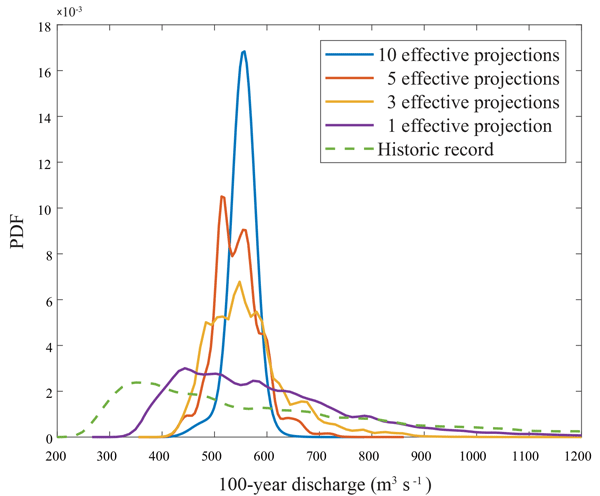 The results show that the model performs well for summer discharges under all analyzed regimes and that model performance varies with mean catchment elevation. In this study we used multimodel GCMs (because of recognized intervariable biases in host GCMs) and two widely used statistical downscaling techniques (LARS-WG and SDSM) to see comparative performances in the Upper Blue Nile River basin, where there is high climate variability. 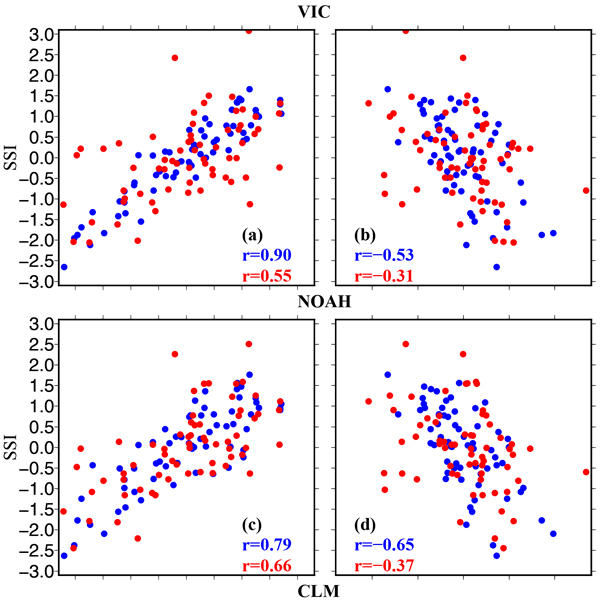 The result from the two downscaling models suggested that both SDSM and LARS-WG approximate the observed climate data reasonably well and project an increasing trend for precipitation and maximum and minimum temperature. Drought indexes are an effective tool to support drought management in water systems, but their definition must be tailored to the features of the considered basin. In highly regulated contexts, non-generalizable ad hoc methods are usually employed to design these indexes. 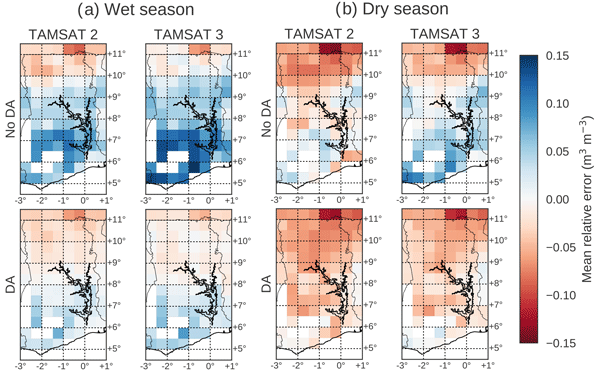 This paper contributes the novel Framework for Index-based Drought Analysis (FRIDA) that supports the automatic construction of basin-customized drought indexes representing a surrogate of the basin drought conditions. 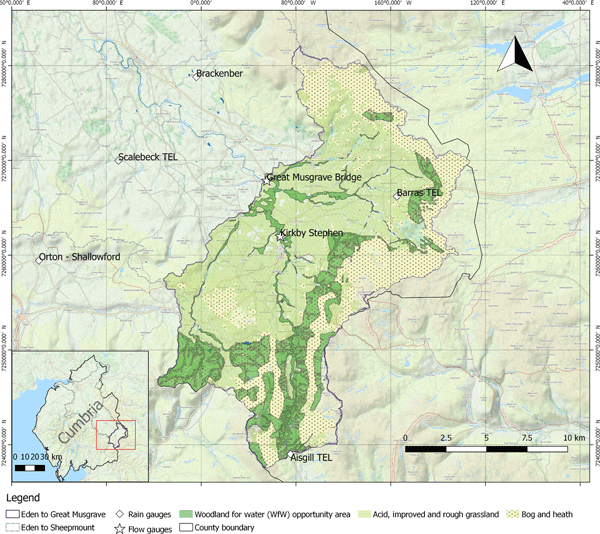 In this work we investigate the influence rainfall and catchment scales have on hydrological response. This problem is quite relevant in urban areas, where the response is fast due to the high degree of imperviousness. We presented a new approach to classify rainfall variability in space and time and use this classification to investigate rainfall aggregation effects on urban hydrological response. This classification allows the spatial extension of the main core of the storm to be identified. 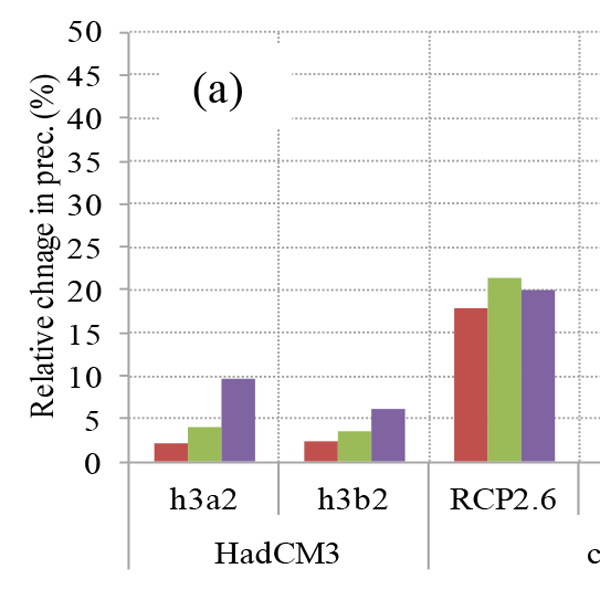 Different crop growths had consequences for the parameterization of root water uptake models. The root hydraulic parameters of the Couvreur model but not the water stress parameters of the Feddes–Jarvis model could be constrained by the field data measured from rhizotron facilities. The simulated differences in transpiration from the two soils and the different water treatments could be confirmed by sap flow measurements. 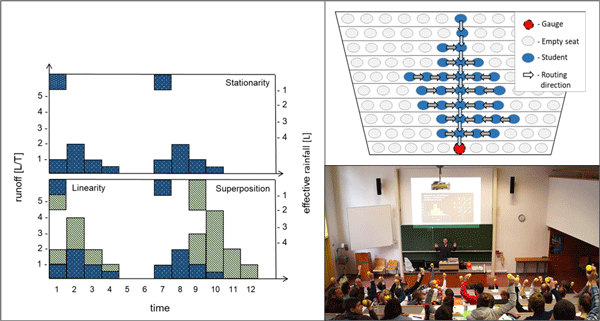 The Couvreur model predicted the ratios of transpiration fluxes better. Several rivers basins in the Ganga plains suffer from very high sediment production in their catchment and there are no good estimates of sediment yield from these basins due to a lack of gauge data. The RUSLE model offers an alternative approach and the same has been applied in a small basin in the Ganga plains. 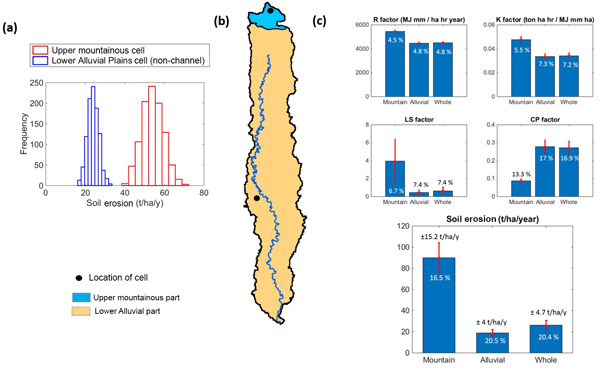 The study demonstrated the usefulness of the proposed methodology for quantifying uncertainty in soil erosion and sediment yield estimates at ungauged basins. There is large uncertainty in the future development of flood patterns, e.g., due to climate change. We quantify relevant uncertainties and show how they can be used for flood protection planning. We find that one ought to include an estimate of uncertainty that cannot be quantified from available data (hidden uncertainty), since projections and data at hand often cover only a limited range of the uncertainty spectrum. Furthermore, dependencies between climate projections must be accounted for. This study investigated the hydrologic responses to wildfires in mountainous regions using a watershed model. The results indicate that while at the watershed outlet the changes in hydrologic responses may not be significant, at sub-watersheds with high burn intensity runoff increase up to 75 % was observed after the wildfire. Also, the chance of more severe floods was increased. The results have important implications for post-wildfire water resource planning and precautions for flash floods. 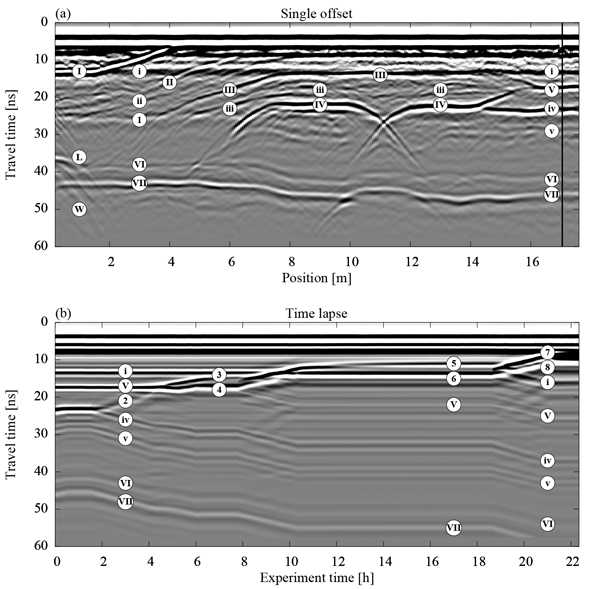 Ground-penetrating radar (GPR) is a noninvasive and nondestructive measurement method to monitor the hydraulic processes precisely and efficiently. We analyze synthetic as well as measured data from the ASSESS test site and show that the analysis yields accurate estimates for the soil hydraulic material properties as well as for the subsurface architecture by comparing the results to references derived from time domain reflectometry (TDR) and subsurface architecture ground truth data. 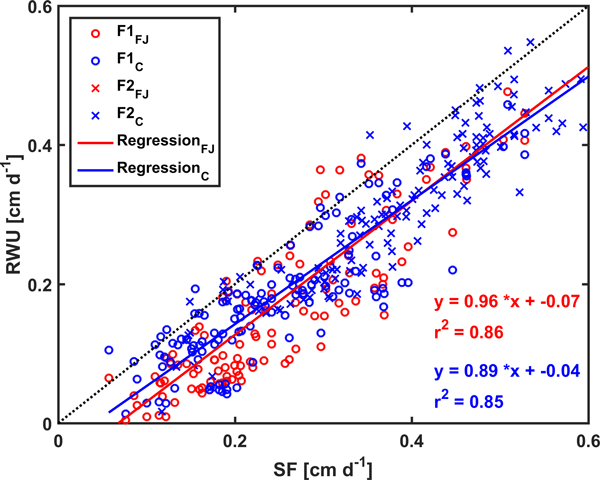 This paper combines satellite observations of precipitation and soil moisture to understand what key information they offer to improve land surface model estimates of soil moisture over Ghana. When both observations are combined with the chosen land surface model we reduce the unbiased root-mean-squared error in a 5-year model hindcast by 27 %; this bodes well for the production of improved soil moisture estimates over sub-Saharan Africa where subsistence farming remains prevalent. Flooding is a significant hazard and extreme events in recent years have focused attention on effective means of reducing its risk. An approach known as natural flood management (NFM) seeks to increase flood resilience by a range of measures that work with natural processes. 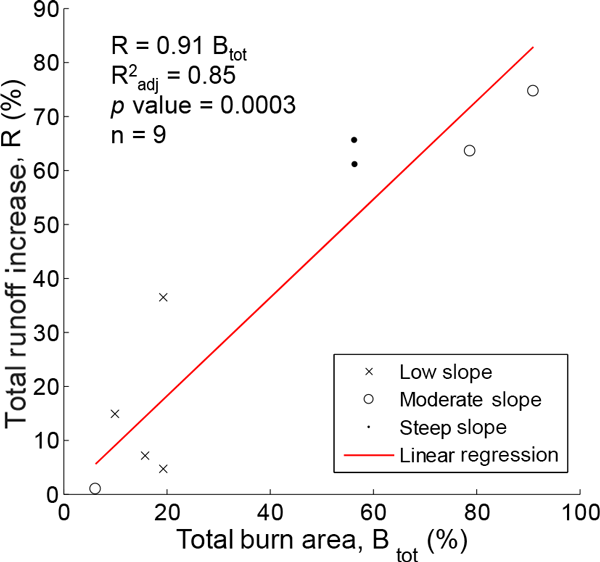 The paper develops a modelling approach to assess one type NFM of intervention – distributed additional hillslope storage features – and demonstrates that more strategic placement is required than has hitherto been applied. The unit hydrograph has been one of the most widely employed modelling techniques to predict rainfall-runoff behaviour of hydrological catchments. We developed a lecture theatre experiment including some student involvement to illustrate the principles behind this modelling technique. The experiment only uses very simple and cheap material including a set of plastic balls (representing rainfall), magnetic stripes (tacking the balls to the white board) and sieves (for ball/water gauging).